Email-writing workshop - Wylie Communications, Inc.
It’s email. And averaging a 4,300% ROI, according to the Direct Marketing Association, it’s all but certainly your most productive marketing channel, as well. But the competition for attention in the inbox is fierce. And that return is an opportunity — not a promise. How, then, can you make the most of your e-zines, newsletters and blast emails? Get Read: Make your message valuable, interesting, easy. 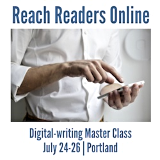 Get Clicked: Reach nonreaders with links, display copy. Get Going: Optimize email for mobile. Get Great: Take your email from meh to masterpiece. No wonder 68% of those emails aren’t getting opened.6 And an average of 276 emails languish unread in inboxes at any given time.7 That’s an increase of 300% in just four years. Because readers open just 32% of their emails. Go beyond the subject line. Make the most of the four key elements recipients consider before deciding whether to open your message — or to delete it without reading further. How long should your subject line really be? 40 characters? 60? 90? More? Don’t forget the most ignored element on your envelope. 24% of recipients check this before opening. Too often, senders forget to write it — or, worse, have never even heard of it. Tap the No. 1 technique for getting opened. Carnegie-Mellon researchers proved it … now it’s up to us to use it. Avoid 3 common subject line approaches that reduce opens. That trick you’re using to draw them in? It may be keeping them out. Assuming your audience members do open your message, people spend an average of just 11.1 seconds on each email they review.8 That’s enough time to read about 37 words. No wonder the No. 1 piece of advice email readers give email writers is to keep it short. Because people read, on average, just 37 words of their emails. Solve the Goldilocks Conundrum. Recipients are turned off by e-zines with too much information — and by those that don’t offer enough. So how much is just right? Choose between three “most valuable” e-zine formats. If you’re struggling with opens, click-throughs and unsubscribes, bring one of these formats to the rescue. Decide when to personalize. Yes, slapping a name in the subject line may boost opens. But it can also creep readers out and make them worry about their privacy — unless you also do these two other things. Make it clever … but not too clever. Readers complain when your email isn’t clever, edgy, insightful or witty enough. They also complain if it’s too cutesy. Find the fine line between interesting and silly. How do your team members reach the three-quarters of subscribers who don’t read our paragraphs? Because people skim — they don’t read — 69% of their e-zines. Avoid the worst link problem. It decreases accessibility, reduces scanning and cuts your chance of getting clicked. Pass the Squint Test. Because if your piece looks easier to read, more people will read it. Don’t get your head cut off.What’s the right length for email headlines that don’t get cut off by email apps, social media — or humans? Master email tables of contents: Do you have a TOC? (Do you need one?) How much detail should you provide? Is it mobile-friendly? Run your TOC through our checklist. Sidestep fat-finger syndrome. Can they click? Optimize links and buttons for mobile. Recipients now read 54% of your emails on a mobile device.11 That makes email the No. 1 mobile activity. Mobile readers click 40% less often.15 And they click on fewer links than desktop or laptop users. Because people rank email’s mobile usability 3.3 — aka miserable. So how does your team reach the huge and growing percentage of our recipients who now read emails on their smartphones? Pass the 1-2-3-4 test to put your message where your subscribers’ eyes are. Tip: Try this simple test on your smartphone for best results. Weed out the top. Are you cramming the top of your message with the three elements mobile readers often skip? If so, you may be burying your important information so deep, nobody ever sees it. How long should your mobile subject line be? Chances are, it’s twice as long as the recommended benchmark. Make it a mullet — and 4 more steps for writing effective mobile headlines. Avoid the Mobile Paradox: The No. 1 activity for mobile users is wasting time. But mobile users get “visibly angry” at verbose e-zines that waste their time. How do you avoid enraging readers? In the crunch of writing headlines and meeting deadlines, it sometimes seems as if there’s not enough time to pause and consider how you’re doing. But in our practice sessions, your team members get a great opportunity for reflection and improvement. Have your team members bring their laptop and an email message to work on. 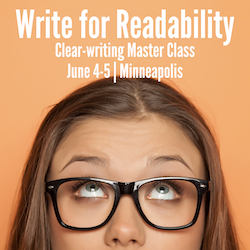 You’ll get a chance to write and rewrite, get and give feedback, and leave with a totally rewritten piece. Make Ann your personal writing coach. Get the word out Leave with proven-in-the-lab best practices for reaching readers at Ann Wylie’s in-house writing workshops. See how your team is doing with customization. I’ll use your team’s writing samples as examples in the workshop. Keep them learning after the workshop ends with a three-month membership to Rev Up Readership for up to 30 members of your team. Master the techniques they learn in class by applying them immediately, getting feedback from Ann and the group, and rewriting. That’s how we put the Master in Master Class. 6-hour session covers the Master Class material, but without the feedback and practice. BONUS: As I’ll be rewriting some of your team’s writing samples to illustrate the befores and afters, I’ll be able to show your participants “How Ann would have done it” in class — one of the biggest requests we get in feedback. Ever wish you had annotated models and checklists for writing your online messages? Let us develop formulas, templates and examples to make your online communications more effective and less time-consuming. Your team will walk away with fill-in-the-blanks outlines they can use to write your most common types of stories, whether they’re tipsheets, survey stories, HR stories, product releases, webpages, brochures — you name it. Plus, you’ll get before-and-after versions of your own pieces illustrating each of the templates. WWAD? Find out with this service.